Map Showing Progress of Allotment in Creek Nation. This Oklahoma map is from the Dept of the Interior, Indian Affairs. 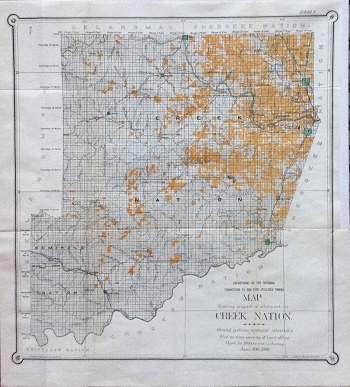 Note that this large map shows the borders of the Cherokee, Choctaw and Chickasaw nations. It measures 19 x 21 inches page size and 17 3/4 x 18 1/2 inches image size.